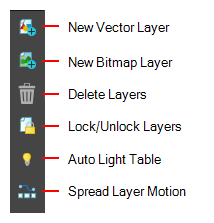 The Layer toolbar lets you add and remove vector and bitmap layers. You can also lock and unlock layers, turn on the light table, as well as spread the motion of a layer across all panels or just some of them. In the default workspace, this toolbar located on the left-most side of the interface. This toolbar is part of the default Storyboard Pro workspace. However, you can hide the toolbar to streamline your workspace. You can display the Layer toolbar horizontally if you find it more efficient for your workflow. Be sure to restart Storyboard Pro in order to see the new position of the Layer toolbar. Select Windows > Toolbars > Layer. Locks or unlocks selected layers. Turns on the light table. Within the same shot, you can spread the current layer motion across all panels or a specified number of panels after the current panel. A new layer will be added and the drawing will be duplicated for panels that do not have the same name in the defined range. See Spreading the Layer Motion. Select the Global UI tab. In the UI Style section, select the Flat Tool Toolbar option. Click OK and restart Storyboard Pro.